The Fern Lace stitch resembles ferns and according to some, it looks like chevron designs running across the work. Knitted in a multiple of 7 stitches plus 2, this stitch pattern is done in a simple 4-row repeat. 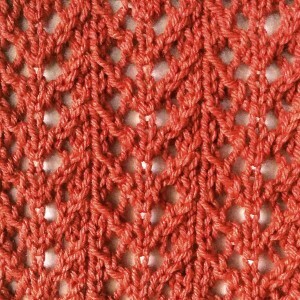 Requiring only simple knitting techniques, the Fern Lace stitch is a fast knit and is easy to remember. Note: blocking is highly recommended for optimal results. Row 1 (RS): k2, *k2tog, yo, k1, yo, sl 1, psso, k2; rep from * to the end. Row 3: k1, *k2tog, yo, k3, yo, sl 1, k1, psso; rep from * to the last st, k1.